After signup users are provided with FTP access to their home directory. To establish an FTP connection, you will need the following pieces of information: FTP login, FTP password, and FTP host name. Select FTP User link in FTP/User Account menu. Login - is the login to be used to enter a user directory via FTP. It is automatically generated on the basis of the account name. Note: instead of using an FTP client, you may choose the built-in Web-based file manager WebShell by clicking the File Manager (HtProtect) link. Password - by default is the password associated with your username. If necessary, you can change and hence make it different from you CP password. Host Name - is a web server domain name to be used to access files via FTP. The simplest way to authorize your friends or colleagues to work with particular directories of your account is to create FTP subaccounts. An FTP subaccount is a combination of a username and a password, which gives full FTP permissions to a single directory, without giving access to the root directory, other directories or the control panel. No dedicated IP is required for FTP subaccounts. Although each FTP subaccount has a login which is different from yours, both have the same ID in the system. At the bottom of the page that shows, find FTP sub-accounts (or System accounts) and click the Add icon. On the next page, enter the FTP login and password that will be used by this other user, and the directory this user will be restricted to. The directory must be relative to your home directory. If you leave the directory field empty, FTP sub-users will have access to your whole home directory. FTP subaccount's directory can be multi-level nested subdirectory relative to your home directory. For Windows accounts you must use the "\" character as a delimiter in the path. You must not add the leading slash (domain.com/dir/subdir - Unix, domain.com\dir\subdir - Windows). When creating FTP subaccounts you can also make the FTP subuser being set up a SharePoint user. For this, on the first step check Allow sharepoint access as well and enter SharePoint settings. 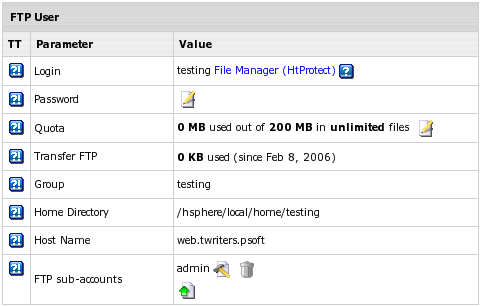 FTP subaccount traffic is a part of the Total/Summary traffic, but you can always see how much FTP traffic has been run up by an individual FTP subaccount by going to the FTP Manager page and clicking the Edit icon next to the subaccount login. Windows FTP-subaccounts work only if Webshell version is 4.3.2 and up. If you are using a dedicated IP, skip this step. Otherwise, switch to dedicated IP. Select FTP in FTP/User Account menu. Click the confirmation link to agree with the charges. This feature allows you to give public FTP access to a dedicated directory in your account. A special directory is created in your root, and its content can be viewed and downloaded, but not uploaded. If you have several domains, choose the one to enable virtual FTP for. On the page that appears, switch to dedicated IP. Skip this step if you have already enabled Virtual FTP. and agree with the charges. Agree with the charges if any. Turn it on. This will create a dedicated directory inside the Anonymous FTP directory. * The Uploads (Windows based plans) / Incoming (Unix based plans) directory have only 'upload' permissions, so it will allow neither downloading nor viewing its content.